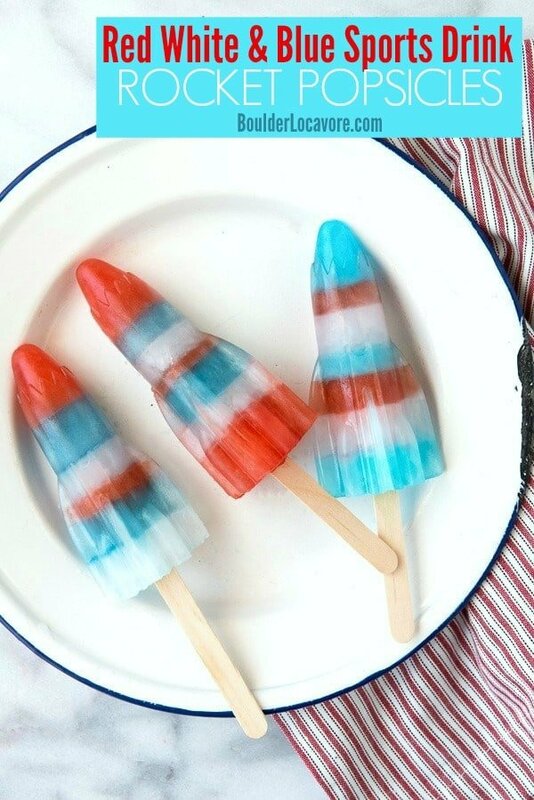 Red White and Blue Sports Drink Rocket Popsicles - Fun to Make! 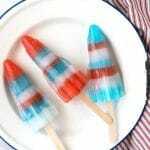 Red White and Blue Sports Drink Rocket Popsicles are easy to make, perfect for patriotic summer celebrations and to keep everyone cool and hydrated in the summer heat. There is one thing the beats the summer heat for me and that is a good old-fashioned popsicle. Whether it’s a boozy cocktail popsicle (adults only please), or something made with fruit juice (and maybe coconut water) OR a recipe that can swing either way like Blue Lagoon popsicles; I’m in. Fourth of July is notoriously beastly in the heat department. Making a cooling red white and blue popsicle that’s hydrating as well as refreshing is a win. 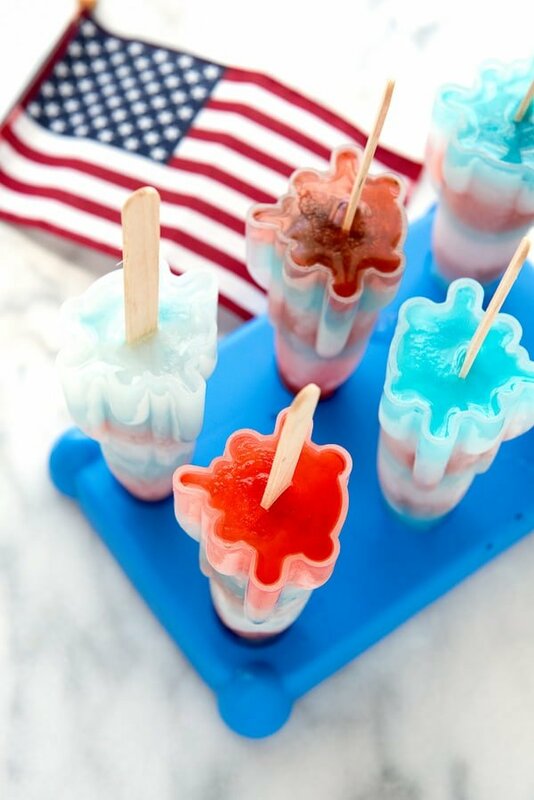 These cute Red White and Blue Sports Drink Rocket Popsicles are all that. Made with sports drinks, they taste great and are loaded with electrolytes to keep everyone hydrated. Sports drinks are beverages designed to help athletes replace water, minerals, electrolytes and energy during and after exercise. Gatorade is one brand of sports drink. I used sports drinks for these red white and blue rocket popsicles both to get nice colors but to replace electrolytes lost from sweating on a hot summer day. Which Sports Drinks were Used in these Red White and Blue Sports Drink Rocket Popsicles? How to make a Layered Popsicle? Making layered popsicles is easy it just takes time to allow each layer to freeze before adding the next layer. I did not want these to be all the same so varied the layer order and size for a fun design. The desired amount of a specific color sports drink is poured into the mold (I used a funnel) then allowed to freeze. Usually it takes 20 minutes to freeze. 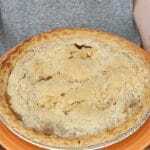 An additional layer is poured in and allowed to freeze. This is repeated until the rocket popsicle mold is full. It is then put in the freezer to fully freeze. It is best to do them when you have a number of hours to allow the layers to freeze. They also can be done over a few days. NOTE: when making layered popsicles wooden sticks must be used (not the stick with drip guard that comes with the popsicles mold). Because sports drinks are poured in and frozen in steps a ‘free’ (not attached to a drip guard) stick is the only way to make them. Create any striped pattern you like. There is no wrong way to make them! How Big are Rocket Popsicles? The molds I used create red white and blue sports drink rocket popsicles that are 7 inches tall and 2.25 inches wide. Each mold holds 2.5 ounces of sports drinks (or other liquids). 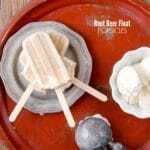 The molds come with a drip guard and stick however traditional wooden popsicles sticks may also be used. Where to Buy a Rocket Popsicle Mold? Rocket popsicle molds can be found seasonally at grocery stores or department stores where kitchen goods are sold. Also, online: rocket popsicle molds and wooden sticks (the molds come with plastic sticks and a drip guard which cannot be used when making layered popsicles). 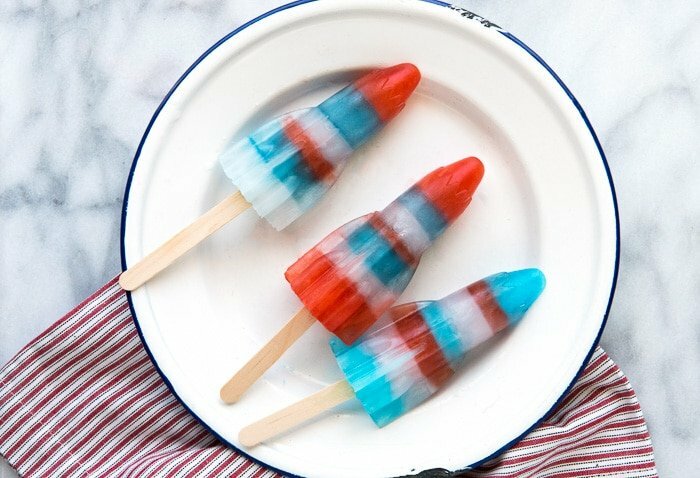 Can you Buy Pre-Made Red White and Blue Rocket Popsicles? You can! 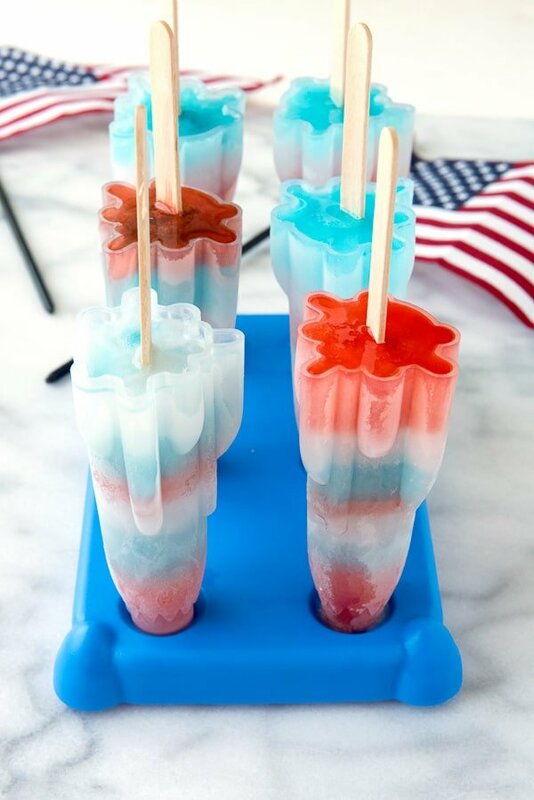 However, these patriotically-perfect red white and blue sports drink rocket popsicles can only be made at home. If you’ve tried this Red White and Blue Sports Drink Rocket Popsicle recipe please RATE THE RECIPE below! Any sports drink brands may be used. Though these are made targeting a patriotic pop, any colors may be used. Instead of using the bottom and attached sticks that come with most rocket shaped molds, traditional wooden sticks are used to allow the layering. Pour some of the sports drink you are using into each popsicle mold for the first layer; using a funnel for pouring into the molds works well. Place in the freezer to allow it to fully freeze (usually around 20 minutes but verify before pouring the next layer). Continue making layers and freezing the popsicles until the molds are slightly under halfway full. Tear a piece of foil to fit fully over the top of each mold. Tightly wrap a piece of foil over the top of that mold and using a paring knife, make a small slit to insert the popsicle stick (don’t make it larger than the stick or it will not hold the stick upright to freeze in the proper position). Insert the popsicle stick. Do this with all of the remaining molds until they all have sticks inserted. Freeze until fully frozen. Continue to add layers, freezing in between, until the molds are full and frozen. To release the popsicles run the outside of the mold briefly under hot water until pulling on the stick releases the popsicle. *Determine the volume of the rocket popsicle molds you are using for exact volume required. Allow aproximately 20 minutes for each layer to freeze. Pour any thickness of layers you desire. Wow those look really good. 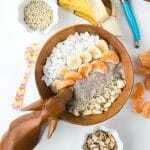 And being homemade they are probably a lot healthier and have endless potential! My friend just said that bomb pops are her favorite. She has to see this recipe. love this idea. i wouldn’t have thought of it. i’ll have to try it soon. i drink a lot of gatorade due to a medical issue, def need this. These remind me of the popsicles I used to get when I was young. I like that these aren’t loaded with sugar and are a yummy way to replace electrolytes. These look so good. 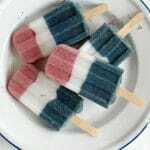 I love the red, white and blue popsicles. I bet they taste great too. I know my girls would love them. These are cute! My daughter would love to make these. I love how colorful they are. What a great idea! I have never thought to use sports drinks for our popsicles…but I know my kids would love it and as a mom I like knowing they are getting that extra goodness when they are out in the heat! This is so awesome! I was that there were some special trick to feeezing them this way so I never tried! I’m supposed to find out they freeze so quickly. In less than a couple of hours I could make a huge batch! Thanks for sharing. Popsicles are a staple in out house during the warmer months. These would be perfect for the holiday too!